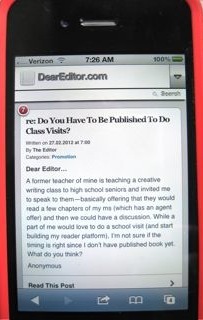 Now you can access DearEditor.com on your iPhone or other mobile device. Go ahead, try it out. And if you’re a social media hipster, you’ll be glad to find DearEditor.com now on Google+ sharing industry news, creative inspirations, and writing tips to keep you in the publishing know. 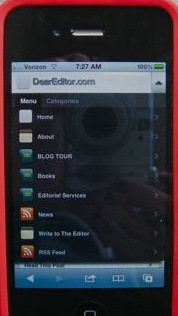 Thanks to Theresa Stanton at blogsforphotogs.com, DearEditor.com is now mobile-friendly. With the new mobile design, you can easily read new posts and comments on your mobile device of choice, and you can post your own comments on-the-go. With a simple click on the arrow at the top of your mobile display, you can access archives, categories, and any page on the DearEditor.com website. DearEditor.com is also pleased to announce the DearEditor.com Google+ page, which complements the DearEditor.com Facebook page and the @Dear_Editor Twitter feed. Previous Post Previous post: re: Do You Have To Be Published To Do Class Visits?